Sales and Promotions -- Updated Weekly! Subscribe to our Mailing List to Receive Notices about our "Plant of the Week" Specials! 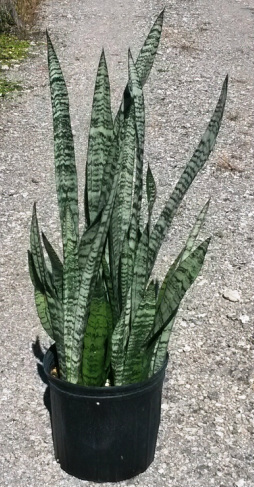 Our Sansevieria Zeylanica are clean with suckers and looking terrific. These Zeylanica have been a favorite for interior landscapers and home owners alike, always known for their ease of care and longevity. This price is only good for orders placed during the weeks of Dec 23-Jan 3, 2014 1 -800-207-5928 to place an order. Book your Christmas Tree orders now! 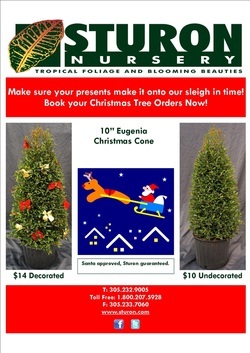 We're offering a fantastic deal on 10" Eugenia Cones: $14 decorarted, $10 undecorated. If you would like a list of our December Specials just click on it.